DeAnna Maganias was born in Washington, USA. She studied at the Rhode Island School of Design and at the Cooper Union, New York. She has exhibited in solo shows in New York and Rome, the Istanbul and Prague Biennales and in the show “Outlook” organised as part of the Cultural Olympics. Works of hers belong to the collection of the Marta Museum in Herford, Germany and Macro in Rome, Italy. She was recently commissioned to create the Athens Holocaust Monument. This is her third solo show with Rebecca Camhi gallery. An important aspect of DeAnna Maganias’ work is about the way objects and places deviate from their commonplace identity, how they gradually become dissociated from their everyday utility when approached from a different point of view. DeAnna Maganias uses all media to create works, which are related to objects, places, conditions that people take as a fact without noticing, emphasizing, that way, our connection to them. 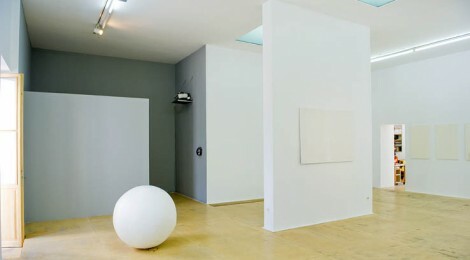 The exhibition title, Bathed in Light, is taken from the work on paper with the same phrase, embossed in Braille in the center of a large white piece of paper displaying. This work is about light and its opposite- the absence of light, and the abstraction of inner vision. Another piece in the exhibition entitled Seascapes is a work on paper with small numbers printed on its surface that refer to actual inaccessible places in the depths of the Mediterranean sea where no light can reach. The drawing refers to the submerged landscape that can only be imagined with the limited information given, it is about the infinity of places that exist that cannot be seen or accessed. In other paintings and drawings, brilliant colours are like flashes of light that illuminate the outline of solid shape. Physical form has fallen away and only bright reflections are left-like shards of visual information.